During this Passover (Pesach) season we are all so busy with the tasks of cleaning our houses and removing all of our chametz from our homes, I too feel so rushed by it. I apologize for getting this to you all just after the corresponding Shabbat for this Torah portion, but I hope this lesson finds you all well and enthusiastic for the upcoming holiday. Pesach is called the Z’man Cheiruteinu – the Season of Our Freedom. We carefully consider each item of our homes and clean out any form of chametz – fermentation grains and leavening, which represent sin and pride in our lives that are holding us back. This is a matter we take very seriously, this act of spring cleaning and carefully consideration of even the minor things mirrors that type of ethical and spiritual checking that should be taking place in our personality as well. Only after we perform all this do we move on to enjoying a happy and kosher Passover, at a joyful table filled with food items on the Seder plate that will continue to drive home other symbolism through our sense of taste. I want us to try to quickly look at this matter of “taste,” continuing with our topic from a previous study relating to taste and kashrut (see Parshat Tzav 2011). They are major issues that come into play in this weeks parsha, and deserve a very good review. I will try not to keep us too long because I know how much work everyone is putting into kashering their homes. But I think this lesson has some interesting points that help put this whole process into perspective for us, and maybe will even lend us some encouragement. In regard to this we are taught in this parsha how to protect the holiness of these offerings, they were to be eaten in a sacred place and in an appropriate (kasher/kosher) fashion. The issue of sacredness and purity is going to be a major topic going through out the rest of Leviticus, what items and areas were considered sacred, and also what made one ritually pure to engage in public worship is a major theme of this entire book. Often times the way the sacrifices were done and who could partake in the eating had to do with issue of ritual purity, if one was clear both organically (health related) and morally to eat of the sacred items. That is why it is so important for us to learn about ritual purity through out this book of Leviticus. you shall wash in a holy place. | bushalah umorak veshutaf bamayim. Anyone who is traditionally observant of Judaism cannot help but almost be distracted by this statement during our Passover cleaning. It appears to be talking about how to make vessels kosher. Though we can gain some good information regarding that from this section as helpful reminders of the kashering process, this is not actually what the text is really about. In this parsha we are taught about the transference of sacredness through taste, that the essence of something is carried by the taste. Because of this anything that touches the hot altar absorbs the taste of that which is upon it and consequently becomes sacred too. (see Parshat Tzav 2011) The item that has been inadvertently consecrated therefore needs to be treated with respect as well. Every part of the offerings and their byproducts needed to be treated with reverences, including the remaining ashes (see Exodus 6:4, the first portion of this parsha) and the left-overs. It is this last point that is being raised now at this time. This point is made by the Torah, by drawing our attention to a garment; something that isn’t a vessel at all. The only thing that makes it fit into this lineup is that it becomes splattered with remnants of the sacrifices, specifically with blood. Though our clause begins by talking about the meat (basar), in the instance of the garment it alternates to talk about the blood instead. Unlike the pots that can have the meat seemingly easily dumped out, the blood absorbs into the garment and it must be washed out completely before the garment can be removed from the holy courtyard. This all seems to make sense to a lot of people, until we look at the one example sandwiched in between the examples of the completely laundered garment and of a copper pot that can be throughly washed out with water; in contrast we are curiously told that the earthen vessel must be smashed. Why does it tell us to do this? The answer might not be apparent to many people, unless one has much experience with cooking and kashrut. Though a garment can possibly be washed out and spot cleaned as recommended, and a metal pot can be washed until there is no blood or fats remaining in it, the same cannot be said for earthenware. We are talking essentially about terracotta, which are porous and absorbent dry pots. Because of their porousness the fats and blood would easily absorb into these clay pots and saturate them, being released along with their flavor in any subsequent use. For this reason it is forbidden to reuse these earthen pots and they must therefore be smashed. Again, this is unlike the metal pots that have no crack or unseen holes in which to retain remnants of the sacred offerings and thus can be reused when clean. This might not be immediately apparent to many people, most people don’t heavily scrutinize their food or their cookware. I am deeply reminded of this during this season, as my friends watch me rush in every direction cleaning and inspecting every little thing for Pesach. Like most people, I’m much more mindful and careful of what I have in my home and on my plate during the eights days of the holiday. Many of my friends find it odd, not because they are anti-religious but because they are so out of touch with their own food. People who can’t understand basic food production are usually more clueless when it comes to their dishes, it’s just too far removed from them. 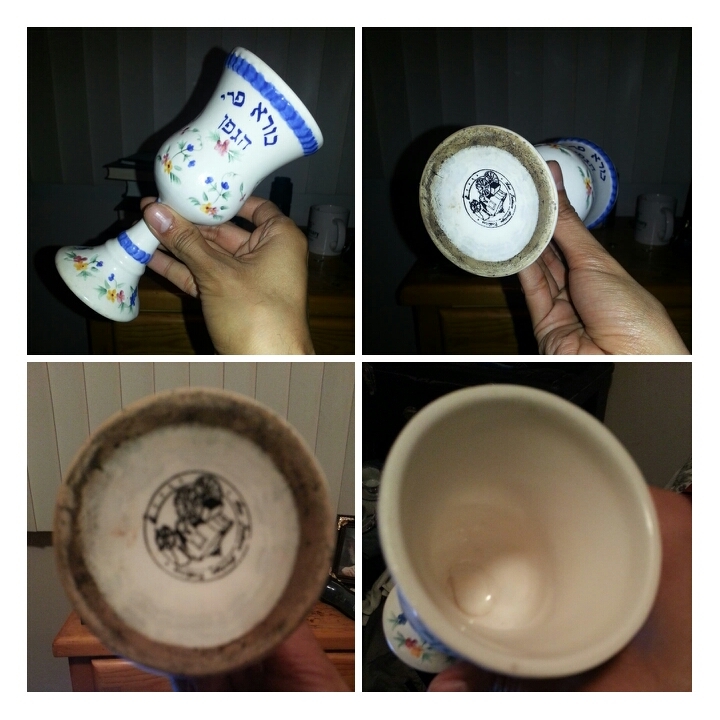 Cracked earthenware, showing where food and potential chametz is hiding, deep into its material. So they stand by and watching me wash glasses, dunk pitchers, and boiling metal items to sterility. They look quizzical as I pack away my normal porcelain tableware, until I call them over to look at the undersides and insides of my vessels. Though most are glazed to keep from absorbing the food into them, you can see places where the protective coat didn’t take or where it’s cracked in time, some revealing deep stains of wine and spices inside the clay and porcelain body. I point out that what’s been festering there is something I’m avoiding with all my might during this holiday, symbolic of my clearing out of my old and sour character traits during this season of liberation. All of this is in aid of eight days in order to get in touch with a more purposeful existence and unadulterated sense of being. Though this parsha is not necessarily about instructing us regarding kashrut but actually talking about respecting that which is sanctified, it does reveal to us the limitations of kashrut upon vessels in passing. Being raised during this season it is actually a very helpful reminder of the rules of kashering your kitchen, something we all need to understand to survive this season. But it is my hope that as we read this we don’t just skim over it, matrixing it into our current holiday routine, and failing to look at the bigger picture of what this section of Torah is about. I also hope that as we inspect our possessions for the Passover holiday, that we don’t just assume anything about our emotional holdings anymore than we should about our general belongings; mindful that just because something looks firm and pure, sometimes the true nature is very different under close inspection. I would hope that just as throughly as we clean our homes we would also engage in a matching inspection of our own character traits, trying to find the cracks in our personality and ethics. Just like with old dishes, we need to look at old habits and attitudes. We need to look at them each and ask ourselves what can be cleaned up and reused, and which just need to be broken. This books reveals a discussion that is initiated by G-d, the people had previously out of fear asked that Moses address G-d for them. (see Exodus 20:14-17) Rashi says that though the voice of G-d was spoken and able to be heard by all, to most of the people it was perceived as a small voice. But in a private audience G-d spoke with Moses, who heard his message loudly and clearly in order for it to be articulated to the people. This is because G-d spoke to him in from one set place, the Ohel Moed – the Tent of Meeting. Now we must ask ourselves what the Ohel Moed actually is. Our Torah speaks of the Ohel Moed in different fashions even over the small span of a few chapters, but by that we see that the Ohel Moed is a concept instead of a rigid and specific proper noun. Its like the American presidential Jet, which ever plane the President of the United States occupies becomes designated Airforce One. A moed is a designated place out of time and space. It refers to any temporary place that was occupied by the presence of G-d before the establishment of a permanent Temple site. It is the second of these meanings that is going to drive this book of Leviticus. Not only is G-d going to speak to Moses from this place, but he is also going to speak to him very specifically about the manner of conduct for this site and the rituals concerning it. He is to relay these commandments to the people. G-d begins to speak to Moses, and to the people through him, the words, “Ki-yak’riv mikem kar’ban / when any man brings….” G-d speaks to Moses very definitely in this statement, not if the people want to bring an offering they should do this and that, but when the do they do. Our sages contend this place of meetings was created out of their need. Moses spoke with G-d at his tent because the people needed someone to represent them at their request, then later G-d provided them a tent of worship because they immensely needed that form of expression as graphically acted out in their repeated experimentation with foreign religion. As we go into this book we need to dispel from our minds that G-d needed anything from these rituals and institutions, but realize at a fundamental level the people needed a form of spiritual expression and representation. These institutions were created for human necessity to connect spiritually. This might be hard for us to understand because for the most part in our culture in the west we have been conditioned into thinking that the primary purpose of the Temple rituals was as a remedy for sin. We will see that at the end of our parsha there is going to be the laws laid out for sacrifices relating to sin – the chatat offering for foolish sins and minor infractions, as seen in chapter four and the first half of chapter five. Then there is the guilt offerings – the asham – for unintentional sins and for misuse of sacred property, for which a person first must pay restitution before drawing near in sacrificial worship again; this is seen in the latter part of chapter five. I must note in review, it is interesting that we see no remedy for intentional sin mentioned at all provided in the Temple offerings. However the bulk of our parsha here is going to concern itself with laying out the other more normative forms of offerings that were given in the Tabernacle and later in the Temple. In chapter one it is mostly going to deal with detailing the laws pertaining to Olah – to burnt offering, specifically of animals. It will define that when one wants to bring such an offering they were able to bring from the cattle or herd of their flocks. This was a special offering entirely for worship, therefore no part of it was eaten by anyone. There were options ranging from bulls to small birds, allowing people of all classes to offer as they could afford. But it clearly only allows animals as meat offerings, only the savory meat of animals proper for consumption would be permissible. Olah means to go up, specifically for the smoke of these meats to rise up as a “ruach nichoach l’Hashem / savory fragrance to Hashem,” or a sweet smell. It would go up entirely in smoke, often mixed with other forms of sacrifice as well. It is easily regarded as a true sacrifice because of the forfeiture of its alah, the cost associate with it. Of course not all offerings were complete sacrifices, and indeed not all of them were for sin. We also have the Zibach Shlamim – the Peace Offering, or Well-Being Sacrifice. We need to understand that this name does not mean it was offered up completely (shalem) in smoke, but that it was zibach (animal sacrifice) as an act of completion (shalam). This was an offering brought by a person who had something to celebrate. At the end of any endeavor or in celebration of any event a person could bring an offering that would be added to the altar of the daily offerings, the fatty parts offered in fire while the celebrants and the priests would feast upon a portion of the meat. This was a sort of thanksgiving offering, which is discussed at length through Leviticus chapter three; a meal shared between the celebrant, the priests and G-d. But the heart of the sacrificial system we have the Mincha offering – the grain or meal offering discussed in chapter two. This really was the most common form of Temple offering. It also held special restrictions like the animal offerings of the Olah, making it on par with the meat offering as a “kaddosh kadoshim / a most holy thing.” (see Leviticus 2:3) In a way it helpful for us to start by thinking of chapter two as being the grain and fruits leg of the Temple offerings; the first chapter was meats, now the second chapter is all about fruits. However the Mincha offerings was more than just an organic alternative, it was the most common of the offerings, so much so that it was offered up everyday in the afternoon. The commonality seems to stem from a few factors, among them being the fact that grain offerings were inexpensive and accessible for all to contribute. Secondly in this agrarian society first-fruits were in a constant cycle of ripening and needing to be offered in gratitude to G-d. Though this Mincha offering is almost a mixture in between the Shlamim and the Olah, because whereas it is sacred and not consumed by the ordinary Israelites, it may be consumed by the priests. A handful portion of grain from it would be offered on the open-air altar, and then the priests would eat the rest of any grain in the form of unleavened loaves of bread. Essentially all the daily Mincha offerings were Kosher l’Pesach – Acceptable for Passover. | lo-taktiru mimenu isheh l’Hashem. As we look at this commandment I hardly need to translate the word chametz – we understand this to mean leavening. But as we can see there are clearly two different words offered for leavening here in this parsha; the first is chametz, the second is se’or. During this Passover season we are careful to clear out the chametz from our homes. We do not just look for yeast in our house, we look for any form of fermentable or fermentation product in our homes. Any untempered grain product that is left wet will begin to decay and turn chametz given enough time to rest and undergo this chemical process. This is often helped by sugar and heat as catalysts to this process, which is why bakers and brewers carefully monitor these factors. If any product that is grain can become chametz under the right conditions then we must ask ourself what se’or is and what distinguished it from satisfactorily being covered by the term chametz. Se’or is a type of chametz, and we also look for any of these types of chametz also during this season, but it is not just a latent form of chametz. Like the honey the se’or is an additive, like a yeast-cake. However, fundamentally it is the same, in that yeast additives were created by leaving a piece of dough aside to grow as a starter batch, this sour-dough starter that would be added to a new lump of dough with the sweetener in order to quickly aid the rising of the bread. The word se’or comes from root word se’ar which means a remainder, it is the rest of a mixture or the other part that is left behind; this is because a sour-dough process is merely utilizing a left over piece of chametz from a previous lump of dough. In light of this during this season it is common for all Jews to review every item in our homes, to remove all forms of chametz. 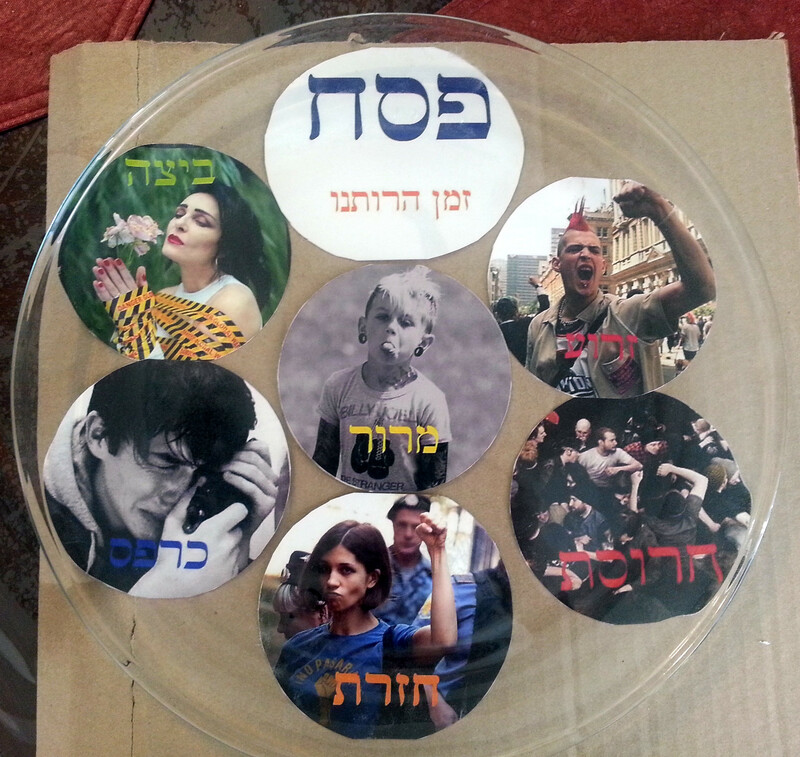 We take this very seriously because chametz represents sin and pride, things that we should remove from our lives during this time of relection and liberation. We don’t merely remove the intentionally and obvious like the se’or, but we also actively and primarily engage in seeking out the latent and less obvious manifestations of chametz – of sin and pride in our lives. Here at the start of our spring harvest season, and indeed our spiritual and celestial New Year, we deal with chametz and sin before their ripened fruits sour upon us. Ordinarily we reckon our tables as symbolic altars already, doing our sacred mitzvot upon it, things like kiddush, motzie, havdalah and learning. Religious Jews are careful to eat kasher – that which is acceptable and appropriate – the food that we place upon it is as carefully considered as if it were given as an offering, never placing improper mixtures upon it just like we would never allow on the altar of the Temple. But during this Pesach holiday we get to further raise our tables to sacred status by also not placing any form of chametz on it in the same manner that chametz wasn’t allowed in the sacrifical offerings. During Pesach our table is given one more profound way of modeling sacredness in our homes and lives as we abstain from chametz. We can see an understanding for why we shouldn’t add chametz to our offerings, but by itself we see no clear reason to prohibit the offering of honey. What could be so wrong with sweetening the offerings? Adding a bit of honey to the meat would marinate the animal offerings beautifully and if added liberally to wheat it would make a sweet cake out of the plain flour. Our great rabbis also provide us several reasons why should not offer chametz or honey, the Rambam tells us that the idolaters were of the custom to only offer leavened bread and sweet foods with meats smeared with honey; we are not to follow after like manner, therefore the scriptures do not allow honey or leavening upon the altar at all. (Maimonides, Guide for the Perplexed, 3:46) This would make sense, a lot of the machmir restrictions we apply to foods is because of the association with idolatry. However our tradition still has much room to weigh in with symbolic reasons. The Sefer haChinuch likens theses two prohibited substances to two type characteristics that we need to overcome if we are to really repent and offer a truly atoning sacrifice. First off we must not be lazy, chemtz is created when a lump of dough is left resting and isn’t worked. (see Soft Matzah: Bread of affliction or fluffy goodness) Its culture begins to spreads through it and inflates the lump as it rests, but will not do so while it remains worked. In constrast, repentance is an active process that we must engage in before G-d and in making restitution to the people we have wronged. While honey likewise represents the yetzer hara (the evil impulse) in another fashion, its sweetness represents lust and unbridled desire. A prohibition against honey is a stand against that sweet-tooth that we need to keep in check as a repentant person. The Rebbe Maharash – Rabbi Shmuel Schneersohn of Lubavitch, the son of the Tzemach Tzedek – also teaches us that there are two symbolic and mystical reasons why we are not allowed to offer up chametz or honey. He warns us that we should learn to not be people of extremes, even things as seemingly simple as leavening and honey are harmful if generously applied. He teaches us that chametz represents the type of person that is constantly bitter and angry at the world. In fact all chametz (leavening) is rooted in chamutz – in bitterness, which is its shoresh (root-word). This is representation of a bitter soul, of the type of person that is constantly mad at the world. This is representative of the man with a chip on his shoulder, constantly ready to argue with anyone. The person who is ever critical and unable to see anything good in the world. And then in contrast there is the other type of extremity as represented by honey, of the person that is overly sweet and cordial. They are constantly cheerful and nothing ever phases them. They have a hard time seeing the bitterness and evil caused by sinful people in this world. A saccharin sweetness that seems almost unnatural because it covers up the true bitterness present in anything, for which we are warned leads to judging both the wicked and righteous of the world by the same relativistic standard. The Rebbe Maharash thus teaches us that we must learn to not be people of extremes, we must neither be too bitter nor too sweet. This quality control of the sacrifices, by neither allowing chametz or honey, hints to the type of control we must master over our emotions. I think these are all great ideas to keep in mind as we put aside our sweet and fluffy challah and bring out our matzot during this passover season. Once the Passover season rolls around I tend to get flooded with emails asking questions about Pesach kashrut and cleaning tips, more often than not from people who are asking my advice regarding the customs of eating rice and beans during the Passover holiday. As I observe the Sephardic tradition, being of Spanish extraction and custom, I have some experience regarding the eating of these forms of legumes during these Passover season. Though I am not a rabbi and cannot give specific rabbinic approval for certain items and practices, I do have a lot of experience in how to apply these types of kashrut from years of observance. Here are some tips and resources that can help people who are new to passover observances, or are new to consumption of kitniyot during the holiday. 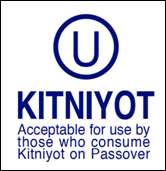 For those who live in Israel, there is some level of certainty to buying kitniyot products that are certified “Kosher for Passover” under the supervision of Badatz Beit Yosef and other independent Sephardic rabbis. However, generally these products have not been imported to the Americas because local rabbinic supervisors have had no experience certifying kitniyot for Pesach for non-commercial use. The reason, simply put, is that the majority of North America’s Jews are Ashkenazi and regard themselves subject to a ban on kitniyot products, as they do not have a custom allowing for the eating of them. Historically there was not much of a demand for pesach kitniyot to begin with, and the general consumers seemed more concerned that possibility of confusing the status-quo of kosher certification outweighed the benefits of satisfying a slim minority. “In time for Passover 2013, OU Kosher Announces New ‘OU Kitniyot’ Certification Symbol” by The Orthodox Union. Though this was announced last-minute and most of us have yet to find these products on the shelves this year, there does seem to be an attempt by the establishment to rectify a general neglect in our society for the minority population of Jews and for those who on account of health reasons require kitniyot to supplement their diet. This is especially egregious considering many of these species are native to our own shores, while the reality has been that Israel has advanced beyond the United States in kosher certification in a proven fashion that demands we catch up. At this time of year kosher supervision is especially critical and gearing up for identifying yoshon items of the spring harvest, it does make this season an optimal time to make a change in labeling, even if these products wont find their way immediately to our tables. So what can one do until we start seeing these newly certified items rolled out? Those who are lucky enough to live in the larger North-Eastern American communities should already be accustomed to finding some access to kitniyot that are chametez-free. Many local Sephardic rabbis do certify small runs of things such as rice for Pesach, these can often be found at the local kosher market or Sephardic synagogue just after Purim. Please be aware that there is never enough to go around, and some places even take waiting lists or merely drop a single shipment that everyone scrambles for so you do want to plan ahead. If you cannot get your hands on one of these shipments or these products are not available in your area, don’t fret! There are also other ways you can acquire consumable kitniyot. 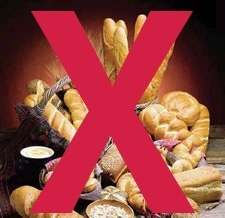 The truth is that for the most part we don’t need to worry about chametz contamination of our kitniyot product in their whole, raw and unenriched form. Grain is most often not grown in shared or cycled fields with most legumes, and if mixed it is clearly evident for removal. This is true for most kitniyot except for rice, which is easily mistaken for barely gains and commonly grown in shared fields with wheat. For this reason rice is the most scrutinized of the kitniyot. It also posses problems related to enrichment, which supplies dietary supplements often derived from grain and even wheat sources. Which is coated over the rice in a starch powder form. Though these enrichment minerals do not identify their source on their labeling most of the time, rabbinic supervisors do usually identify which brands and types of rice are not enriched with chametz for that year. “White Rice: Any unenriched or organic rice is acceptable. 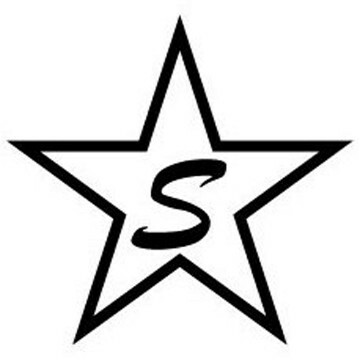 Star-SP has made a special run of certified unenriched Carolina. It is not pre checked. Please check 3x according to our custom! Super Lucky Elephant brand (Star K) available at Costco and Walmart. Sugat brand from Israel. Kitniyot OU, Kitniyot. “Short grain: Nishiki, KoKuho and Cal Rose brands (K-ORC) are also enrichment free. They can be found at Wegmans and most Oriental stores. Also Lundberg’s Organic (not mixes). “Brown rice: Any brand without additives. The brand at Costco looked very clean and easier than most to check. Though theoretically all unenriched rice is appropriate for Pesach consumption, one should pay special attention when purchasing to not buy from open bins. This is not just because of the lack of labeling to identify enrichment. This is often the poorest quality, just like the beans in open bins, are often more “dirty” and contain more waste such as rocks. Likewise bin rice tends to have more barley contamination. The use of more efficient irrigation methods today allows farms to more readily rotate their crop. Of course this technology and method is also used in other states as well, including Oklahoma. This poses a risk for cross contamination during harvesting. It is precisely for this reason that all rice that is purchased, whether or not it is certified as Kosher for Passover or “KITNIYOT” per it’s certification, needs to be checked by hands for chametz contamination. This requires the examination of each grain of rice, and the common custom is for rice to be inspected three times by hand. 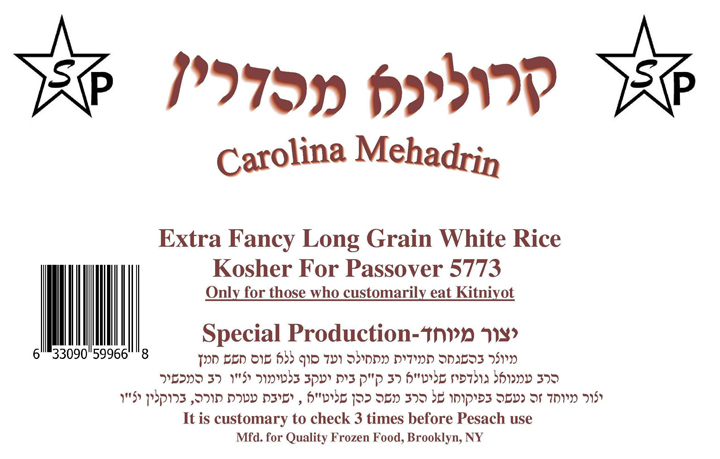 This applies to all rice, including the Carolina Mehadrin (Star-S), which is assured to not be grown near or packaged with chametz machinery of any form. Though there are not any authoritative seforim that concisely describe the kashrut concerns for those who are kitniyot observant, we have much to draw from by following the customs handed down from generation to generation. The custom of checking rice in this fashion is something that is well established for all Sephardic communities. It seem that the perceived tediousness of inspection explains in part explains for why some Sephardic communities (including some Moroccans), despite being permitted, do not consume rice at all to avoid this cumbersome task. One should follow the advice of their own community rabbis concerning the checking and consumption of kitniyot, often times they will have the best grasp of the local food offerings and their production quality. Sometimes these offerings will extend beyond the obviously certified products. Thought the new kashrut classifications do promise to make many more products available to the consumer, we should also recognize that this is also a clear response by the kosher supervising agencies to reinforce the concept that no processed, consumable items should be utilized unless they bear proper certification or you are advised by your rabbi. This is especially important to stress to the newly observant, who often assume that kitniyot consumption is a leniency that readily allows one to eat most regular foods during the Passover holiday. As we see kitniyot is not necessarily “easier,” it is an active minhag that is also demanding and should not be regarded as the mere absence of a prohibition. No matter what tradition we are from, this holiday does offer us a time to get more in touch with the basics of natural, organic and unadulterated foods that are free from major restrictions and limitations. Hopefully these guidelines can help us select more food choices with certainty for a truly joyful and kosher Pesach. Please note that product and brand information is updated and valid for Passover 2016 and subject to change! For most frum and traditional people, substitutions are an everyday occurrence. Having to balance the issues of meat and dairy in a culture that has a pallet for mixing has led to people using a lot of health food alternatives to get some of those fusion flavors and still adhere to kashrut. It surprises many people that the orthodox don’t blink twice at mixing in adventurous health food options. No other time does this openness and experience comes in handy then at Pesach. Ordinary during the year we make use of items such as Rich’s Whip as non-dairy whipped cream, Mocha Mix or soy milks for baking and table serving, milk-free cheese, tofu ice cream and cream cheese, and much use of meat alternatives (would pizza be the same without Soy-roni “pepperoni”?). Unfortunately a lot of these products will not be any aid to many people during the Passover holiday. Many of these products contain ingredients taken from the five-grains (wheat, barley, spelt, rye and oats), most often are made with wheat and oat products (items such as xanthan gum, malt, flavoring, sweetening and thickening). Some are even fermented with the aid of grain and/or yeast (textured vegetable protean and tofu products). 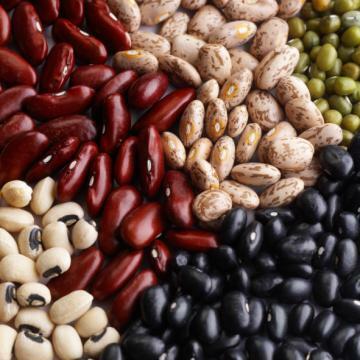 Secondly, many health foods are kitniyot – made from legumes, beans and rice. Ashkenazi Jews of Eastern Europe are most often accustomed to not eating any of these products (including corn, soy, etc.) during Pesach; in order to not confuse one with the appearance of eating chametz. However, these products are generally permissible to people of the Sephardic/Mizrahi tradition (Spanish-Jewish, Middle-Eastern) who are not subject to this ban. The best way to know is to ask your own rabbi. But there are certain steps you can take in considering your chametz issues to help make this process easier and help save you time asking questions during this busy season. The rule of thumb is: if there is a kosher-for-passover certified product available one should utilize that product over and against the non-certified option. For simply raw items that are ketniyot there is no need for certification. However, we must bare in mind that many of these bean, rice, corn and like products are stored or processed on the same machinery as grain products. For Sephardim who do eat ketniyot, it is necessary to check through all the grains of the product to ensure that it has not been mixed with chametz grains. One should check the item visually and by hand 3 times (or as much as 7 times for commercial cooking) to ensure they are free from cross contamination. Note: this checking should also be taken with quinoa as well; it has been brought to my attention by poskim who have gone to South America to supervise these products have seen quinoa harvested in areas nearer to the lowlands which are hospitable to grains. The quinoa is imported exclusively from Bolivia and packed by companies that pack whole grain quinoa exclusively. While there may be others Ancient Harvest, Trader Joe’s, and Sugat (a brand of quinoa sold in Israel) are brands that only import quinoa from Bolivia and only pack whole grain quinoa. Another reason for why rice poses a problem, is that rice is often grown in shared fields or cycled after a harvest of barley, which is chametz. This leftover field barley can often be harvested with the rice and is hard to distinguish because of the shape and light color. One should pay special attention when purchasing, so as not to buy from open bins. This is often the poorest quality, just like the beans in open bins are often more “dirty” and contain more waste such as rocks, so too bin rice tends to have more barely (trust me, I’ve been Mexican-American my whole life, I know whats up! I’ve seen the kids playing in them like a sandbox long enough to notice). Oils are one of the essential ways of getting amino acids and essential vitamins. Good use of oil helps provide all the good cholesterol we need. Those of us who are dietary challenged often must make regular use of oils to supplement these needs. “The earlier Poskim, including Rema, clearly indicate that oil made from kitnios is forbidden on Pesach, but some of the later Poskim suggest that such oil may be permitted because some of the original reasons for the minhag don’t apply to the oil extracted from kitnios. It is generally accepted to follow the stricter opinion in this matter, but the lenient opinion is sometimes considered as one factor in a larger decision. “Therefore, on Pesach one may not use corn or soybean oil (a.k.a. “vegetable oil” ), and some do not use peanut oil either (see above regarding peanuts). Oil from olives, palm, coconut and walnuts are acceptable for Pesach use because the fruits they are extracted from is not kitnios. Minchas Yitzchok (III:138:2) suggests that cottonseed oil is kitnios, but in a subsequent teshuvah (IV:114:3) he reconsiders this position (see also Mikra’ai Kodesh, Pesach II:60:2); in the United States cottonseed oil is generally not considered to be kitnios but in Eretz Yisroel there are those who refrain from using it. Though the soy and legume problems seem to be the most pertinent for health-foodies, we also need to consider the obvious; how do we get around flour and wheat product issues? For many people this is not just a Pesach issue, more and more people are becoming aware of wheat allergies and the effects it has on conditions such as celiac disease. For those of us who eat gebrochts (yiddish: for broken; meaning broken matzah that is mixed with water), we often make use of matzah meal and matzah cake mix instead of ordinary flour which in all cases is considered chametz. Only wheat that has been watched from harvest to baking to ensure it has not come into contact with moisture is considered kosher-for-passover. Once wheat is baked it is not possible to become chametz. For this reason we use matzah meals which are tempered as it is less likely to become chametz due to this full baking process. It is ground into various grades of meal fineness and used for cooking and baking. Matzah meal is good for dumplings and stuffings; as it is course. 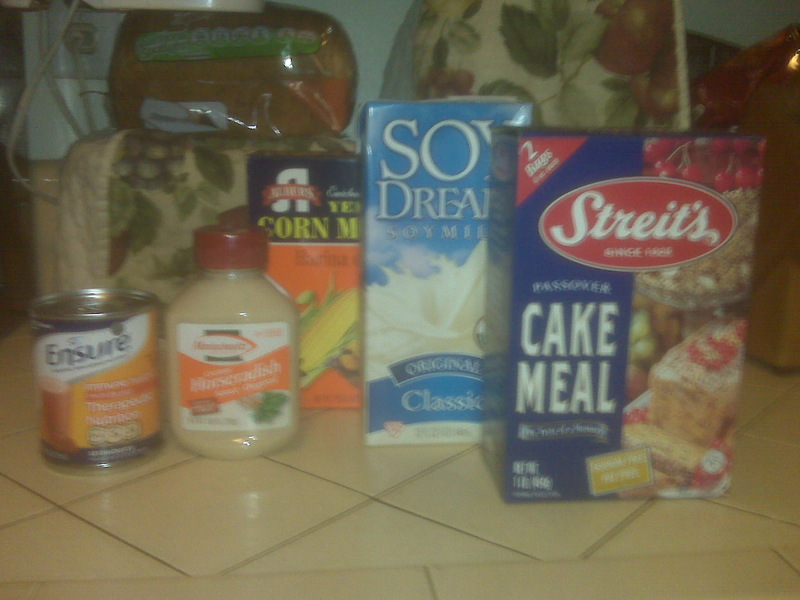 Matzah cake mix is perfect as a flour and cake flour substitut; as it is much finer. This is the widespread custom for most Jewish communities to make use of cooked and wet matzah, though there is a ban for certain communities including some chasidim (hopefully we will discuss this in upcoming studies). 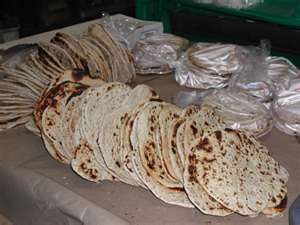 Because of the prevalence of people to adhering to a stringency to not eat gebrochts (namely Chabad chassidim) and the influence of wheat-sensitivities many kosher producers have begun to phase out use of matzah meal and substitute it with potato flour for cakes, cookie, dumplings and anything they would ordinarily use wheat for. Those who eat kitniyot can likewise make great use of corn flours and starches for baking and thickening needs. They both are excellent for baking and helping bind foods together. So when it comes down to it, we need to be careful not to freak out when we see certain fermentation products that are certified as chametz-free. The reason baking soda and powder can be used is because unlike yeast which metabolizes sugar in flour in order to produce CO2 (carbon-dioxide) bubbles, baking powders and soda do not. Sodas and powders cause a chemical reaction which causes a dough to rise but the food product is unchanged, whereas yeast changes the physical compounds and properties of the grain itself in its chemical process of leavening. Powders and sodas are not any more chametz than blowing air into a food with a straw. This year our kosher-for-passover products seem to be Arm and Hammer, Geffen, Haddar, and Masphiach (“Kosher for Passover ONLY when bearing special certification”). As is widely known, our rabbinic law gives paramount prescience to our health and wellbeing. Our rabbinic maxim is: “pikuach nefesh docheh et hakol / the preservation of a life overrides all considerations.” We are to live by this Law, not die by it. We must submit to any medical consideration that limits our ability to adhere to our religious obligations; be this fasting or taking on Pesach restrictions. However, during Pesach we are careful to take extra consideration of chametz. The last thing most of us want is to be cut-off or alienated from the celebration and our community and therefore do as much as we can to adhere to a chametz-free Pesach. That does not mean we are not allowed to relax for the young and the sick. Being observant and relaxed are not mutually exclusive. Many of us who live in the big cities are very blessed to have a side range of food available to us that there is not a whole lot of need to utilize chametz as appropriate chametz-free equivalents are available to us. But one should carefully follow the advice of their doctors and personal rabbis before making any dietary changes. Often times the need to change over to Pesach foods requires a gradual transition to not shock one’s body, consulting a nutritionist would also be helpful. One of the most important parts of the modern diet is the use of soy/rice/almond/coconut milk and other dairy substitutes. These are useful ingredients in today’s kosher kitchens and on our daily menus. And essential parts of fortifying healthy, vegetarian and vegan diets. As we won’t really find any with a kosher for passover certification in our local stores, and they certainly are processed foods. 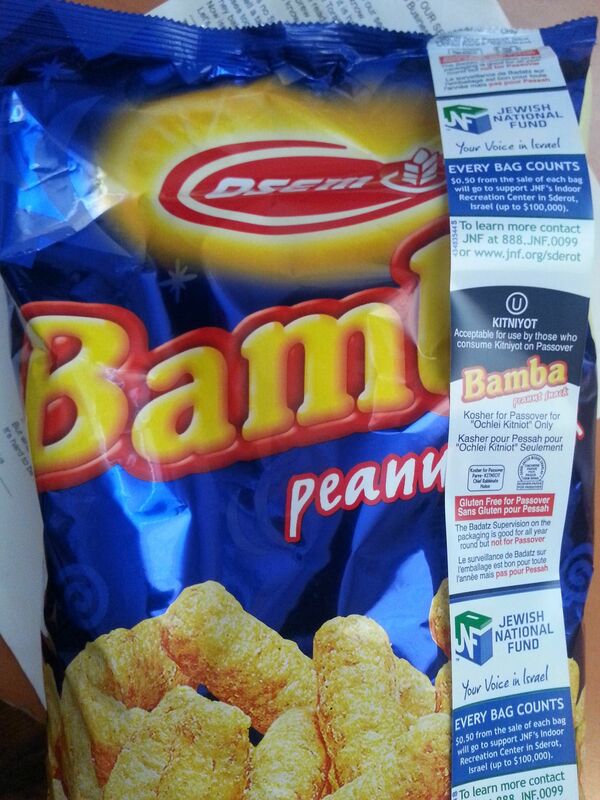 So how do we known which are chametz free brands for Passover? The reason one needs to be especially sure to check their dairy-free milk products is because some of these products are blended with filtered wheat and oat milk (Example: most brands of EdenSoy Soymilk; including Eden Soy Original, Extra and Vanilla; as they use wheat and barley extract). Unfortunately, there is no recommendion for soy coffee creamers, which are often are made with additional starches and other processed materials which are actual chametz. One of the best ways of keeping things chametz-free is to cook from scratch. That is the other part of the Pesach preparations that is just as much hard work as the cleaning. But it is a fun and very healthy yearly experiment with getting back to preparing foods from their basic raw ingredients up. This is a perfect time of year to make decent use of fresh produce, natural meat and organic dairy products. Just keep in mind as your preparing for the holidays to read labels and ask yourself all the right questions to yourself. Some things aren’t always so obvious. Remember, flour tortillas are not kosher-for-passover; they uses chametz flour and even bakers yeast! Neither is many brands of soy sauce, often actually made of fermented wheat. Consider the source and the additives added to stuff you eat daily, and you will see which foods are best to avoid for this holiday or to substitute for its duration. Think along these lines and you will be on your way to a healthy and chametz-free home in no time. I wish you all a joyful and kosher Pesach! Is it permissible for one to have soft matzot for Pesach? Soft Sephardic-styled matzah waiting to be packaged. Some people love matzah. I’m not necessarily one of them. I mean I use matzah meal for cooking throughout the year, but I’m not a fan of machine-made matzot. You know them. They come in boxes, which makes sense for some of us as they closely resembles the taste of the cardboard container itself. No really, those crispy crackers taste good when you start the week. But usually a few days in you start to understand the whole “bread of affliction” metaphor. Most of us don’t say it because of the dry lump in our throat, or because we are more preoccupied with the mirroring one in our digestive track. All I have to say is, suffer no more! Get soft matzot! That’s right, I said soft matzah bread for Pesach. I would love to do a good blog about the history of matzah. But most of us know this history quite well, and realize that the crispy crackers that we have today are a result of a fully automated process that was created about 150 years ago. Even if we use handmade matzot, their evolution to a bread identified by its perforations and crispy thinness has sustained as mehadrin and machmir (stringent) to the point it is almost universally utilized as our only style bread for Pesach in the greater Jewish world. But it wasn’t always so. More precisely, it isn’t always so. For some Sephardim and Mizrahim, automation is not widely known in their communities and they still utilize homemade or community made matzot that are according to the pre-Industrial, handmade method and retain a fluffiness akin to Pita bread. How is this possible? The issue of chametz (leavening) comes down to not allowing our flour to rise. It rises without even introducing yeast. In fact, historically we need to understand people didn’t usually go down to the local Food4Less and get a packet of yeast. It was done by fermentation of actual flour itself, like the sour dough process in which decay and fermentation in flour spreads its leavening to the rest of the dough, so that it will rise with appropriate heat and time to rest. The last detail is part of the trick. As long as the dough is not allowed to sit more that 18 minutes it will not become chametz. As long as the dough is kept kneading it will not leaven. In the Sephardic world it was common practice for whole teams of people to keep working the dough to keep it from this form of leavening. The resulting dough, being more worked would become softer and retain some of that even once baked. The minhag also allows for thicker matzot too, thus explaining why they are akin to everyday pitot or laffa bread. “Q: Is it permissible for Ashkenazim to eat soft Matzah, like the Sefardim? In keeping with current standards for Pesach food preparation, they are all expertly prepared in under 18 minutes; which makes them equally on par with all the standards as that of crunchy matzot. Now this announcement isn’t exactly a comfort to the masses, as they are still hard to get if you don’t live in a major Sephardic Jewish community. One of the reasons they are now becoming more widely available today is because of the of aid of modern technology as well. Such soft matzot tend to dry out very quickly and usually have to be used the same or next day. Though freezing has allowed them to last longer. But if your don’t live in one of the major communities its unpractical to try to buy these matzot and have them shipped to you as the cost of shipping can easily be double the cost of the product itself; they need to be shipped overnight in order to remain frozen. Nonetheless you can order them online.